For millennials and others open to new ways to manage finances, financial apps for Android offer just the right mix of speed, convenience and personalization. As more finance consumers turn to mobile solutions, banks are coming up with increasingly innovative ways to enhance their customer service offerings through digital technology. For example, Wells Fargo is experimenting with geolocation services that would welcome customers by name as they walk into a branch, and many banks are offering a combination of robo-advisors and in-person consultations to cater to digital banking consumers. As mobile apps continue to gain traction in 2017, here’s a look at ten Android mobile apps that are changing how consumers manage their finances. 1. Credit Karma: A credit and financial management app, Credit Karma gives you quick access to your free credit score, provides information on how to get a better score and analyzes your spending to find ways to save. This year, Credit Karma is also introducing free tax software, with features such as automatic alerts on important changes to your credit report, the ability to dispute an error in your report from within the app and tips on which cards and loans might be best for you. 2. Venmo: When you need to split a bill or divide the costs of attending an event, consider Venmo, made popular by millennials. A PayPal company, Venmo lets you send and receive money among friends and family by using only a username, email or phone number. While it started out as a peer-to-peer (P2P) solution, users can now pay with Venmo inside participating merchant apps, either to check out when making a purchase online or to split the bill with a friend. 3. Mint: The long-standing leader for personal finance management (PFM), Mint helps consumers see their total financial picture across multiple accounts, budget their expenditures and improve their creditworthiness. As a result of a recent addition, Mint now allows users to track and pay bills alongside watching their spending, so they don’t need to use the Mint Bills app unless they prefer to use a stand-alone bill pay app. 4. Robinhood: For those who don’t want to open a full-service brokerage account or use a discount broker, the Robinhood app might be a good choice. A relatively new startup, Robinhood has a better user experience (UX) and charges less than traditional players in this space. You can obtain market data and quotes in real-time, create a customized stock watchlist and place orders for low-cost trades. 5. Chase Mobile: The Chase Mobile app lets you keep tabs on your money, make transactions, set alerts and manage your cards. JPMorgan’s recent partnership with Intuit, maker of Mint, TurboTax Online and QuickBooks Online, allows Chase customers to grant Intuit access to their financial accounts. The partnership allows for fast and secure download of customers’ financial information to be populated into Intuit products, such as Mint, without customers having to enter usernames and passwords. This partnership points to the broader trend of traditional banks partnering with technology companies to modernize offerings. Security is crucial in mobile banking. 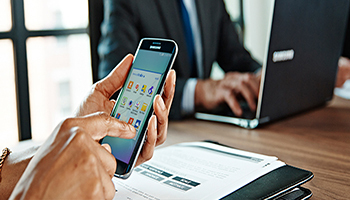 Download the white paper to learn why Samsung devices are some of the most secure available. 6. Simple: If you prefer a smaller bank, Simple began as a finance management startup. Many consider it one of the best digital banking providers today, although it’s now owned by a global bank, BBVA. Simple’s Better Banking app allows you to do all your usual banking activities, but do them “beautifully,” with an elegant interface and smart features, such as letting you lock your card with a tap if you misplace it. 7. USAA: The Android app for USAA ranks in the top ten list of financial apps for Android, in part because of USAA’s exceptional pricing and service, and in part for the quality of its app. USAA Mobile offers users fast and secure account access from any mobile device, so users can manage their finances, investments and insurance. 8. Betterment: If you like to keep track of your investments yourself, consider Betterment, a robo-advisor that helps you allocate a portfolio into ETFs and track your investments over time. A fast-growing startup, Betterment’s succeeded at delivering a financial management app that stands out from the competition. In addition to monitoring stocks and bonds, Betterment includes automated features such as automatic deposits, dividend reinvesting and rebalancing. 9. Fidelity: If you want access to an independent, fee-only advisor, look at those using Orion, Fidelity or Schwab. Fidelity’s mobile app for clients of advisors offers research, trading and alerts, along with a cutting-edge design. The Fidelity app offers customized features such as tailored content and news, as well as money management tools, a watch list and news and video on international markets. 10. GEICO: A top ten financial app for Android, the GEICO mobile app lets users view ID cards digitally, pay bills, get quotes and submit claims. It won’t (yet) change a tire for you if you get a flat, but through the app, you can contact roadside assistance if you ever need help. In the future, the GEICO mobile app for Android will feature Kate, a virtual assistant designed to answer questions about billing, policy details and more. As financial app usage continues to steadily increase, banks must keep up with trends and offer increasingly diverse mobile options for consumers. These ten apps offer just a glimpse into the diverse array of services mobility can provide for banking customers. Stay in tune with the latest finance and banking trends by checking out our complete line of finance technology solutions.